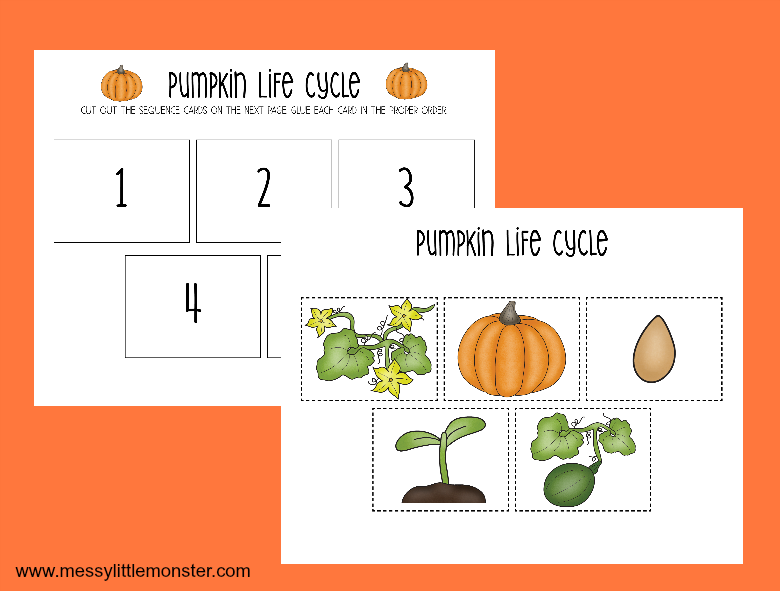 This set of printable pumpkin life cycle worksheets are fantastic for young children that are interested in finding out about where pumpkins come from. Whether you are doing a pumpkin project for preschoolers or looking for autumn activities for kids these worksheets would make a great addition to the subject. Why not have a go at a few of our pumpkin crafts and activities too! As well as the pumpkin life cycle printables that we are sharing today we have lots of other fun pumpkin themed activities for kids that you might like to try. Preschoolers would love our puffy paint pumpkins or colour mixing pumpkins, slightly older children would love making (and eating!) our mini pumpkin pizzas and our healthy pumpkin snacks are easy enough for children of all ages! If you are looking at the pumpkin life cycle with young children it is really important that you have a few real pumpkins for them to explore as well as these printable pumpkin life cycle worksheets. Once you have had a look inside the pumpkins why not keep a few of the pumpkin seeds and use them to make pumpkin slime! 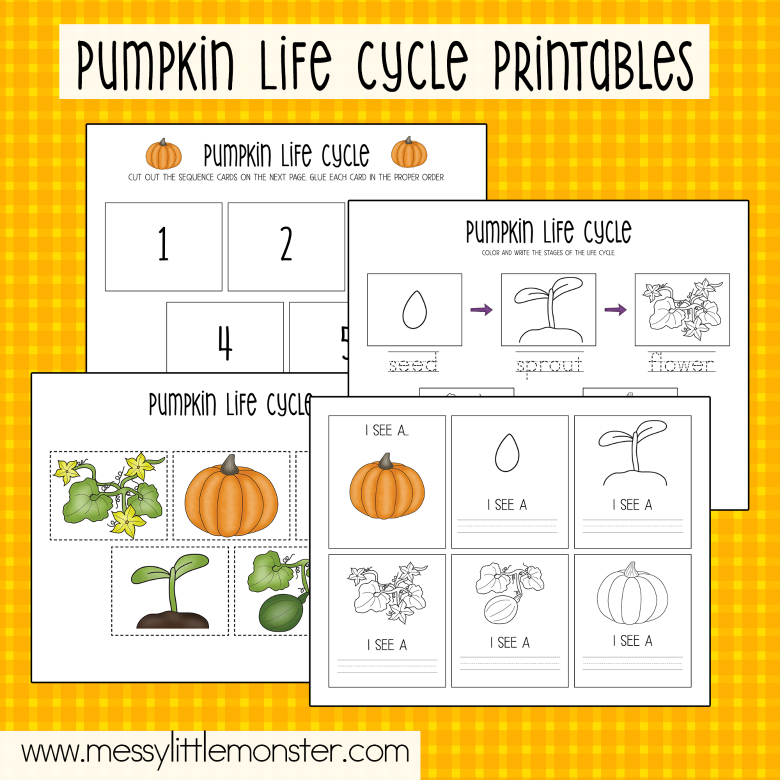 This printable pack of worksheets on the pumpkin life cycle is a great way of young childen discovering and recording what happens as a pumpkin grows from a seed into a sprout and then from a flower into a pumpkin. There are 3 different activities included in the pumpkin life cycle pack. The first activity involves sequencing the different parts of the pumpkin life cycle in order. There are 5 images to be cut out, each with part of the pumpkin life cycle. These images are to be cut out and stuck on the numbered sheet in the correct sequence. The second activity involves learning what the different stages in the pumpkin life cycle are called and having a go at writing them. Children can trace over the words seed, sprout, flower, green pumpkin and pumpkin. In the final activity children have to complete the sentence I see a.... using the pumpkin pictures as prompts. It would be really fun to cut these out and staple them together to make a mini pumpkin life cycle book. 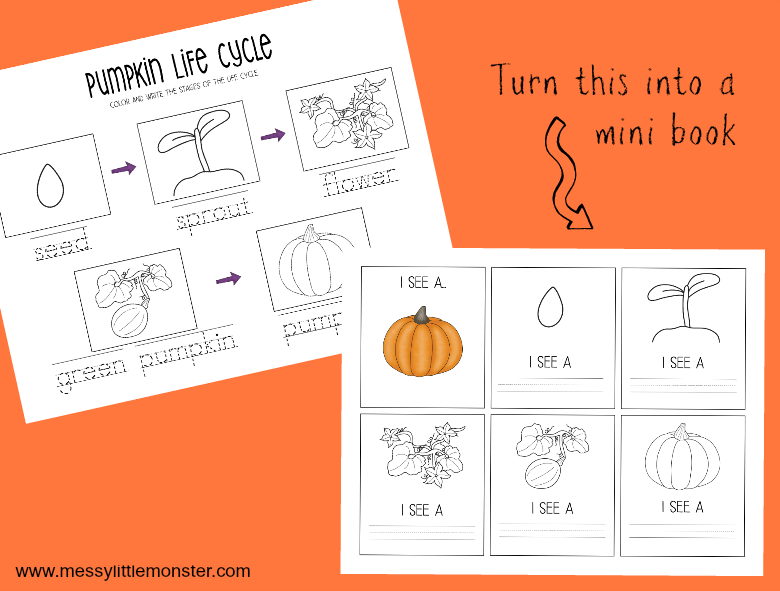 To download this printable pumpkin life cycle worksheet click on the 'I want this' box below. It may take a moment for the page to load so please be patient. For personal and classroom use only. Not for redistribution. All images are copyrighted. When sharing this printable please link directly to this blog post and not to the PDF. Thank you. 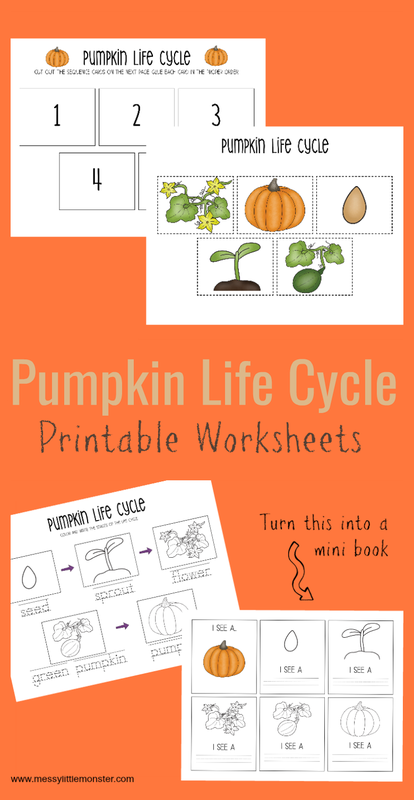 We hope that you enjoy using these printable pumpkin life cycle worksheets as part of a fun pumpkin or autumn themed project. Don't forget to take a look at all our other pumpkin activities for kids.